The renowned Godrej Properties is proud to announce another of its prestigious project in the city of Gurgaon, called Godrej Oasis. This project is awarded the “Most Promising Upcoming Project of the year” at the North India Real Estate Awards 2014. Undoubtedly, home seekers and investors investing in the project are going to reap rich benefits in the future. Godrej Oasis Gurgaon boasts of stunning 1, 2, 2.5 and 3.5 BHK apartments that reflect architectural brilliance and super luxurious living. Home seekers who are looking for a modern world-class lifestyle in a superb location will love this residential complex. Aesthetically designed, Godrej Oasis offers you a contemporary apartment experience in the midst of beautiful nature and world-class amenities. Residents can have a spectacular view of the lush greenery and green courtyard from their spacious balconies. The rooms are spacious and allow natural light to flow and the cool breeze to enter the room. The interiors of the apartment are stylishly designed with rich furnishings. The amenities that are available in this luxury complex are incredible and are designed to give you a life of comfort and luxury. Key features of the apartments are a meditation area where you can relax and enjoy your surroundings, kids play area where kids can play and mingle with each other, modern gym to keep you fit and fine, a multi-purpose hall, shopping center to meet your daily shopping needs, video security, landscape garden and many more. Residents will fall in love with the green spaces and the beautifully designed Central Courtyard that adds to the charm of the property. The best part of Godrej Oasis is its location. It is located in a posh locality which is just 400 mtrs. away from the Pataudi Road and 1.5 kms away from Dwarka Expressway. Some other important locations and landmarks of the city are also located close by such as NH 8, Hero Honda Chowk, CPR, etc. The proposed Metro Station is just 5 minutes away and the airport is just 25 minutes drive from the property. The luxurious apartments are quite affordable. Godrej Oasis Price starts from Rs. 64 lakhs for 1 BHK apartments and goes up to Rs. 1.28 crores for 3 BHK apartments. Every project that Godrej Properties brings to you comes with a mark of excellence and a promise of a fantastic lifestyle. Godrej Oasis follows this trend and brings to you a lifestyle that you and your loved ones will cherish forever. 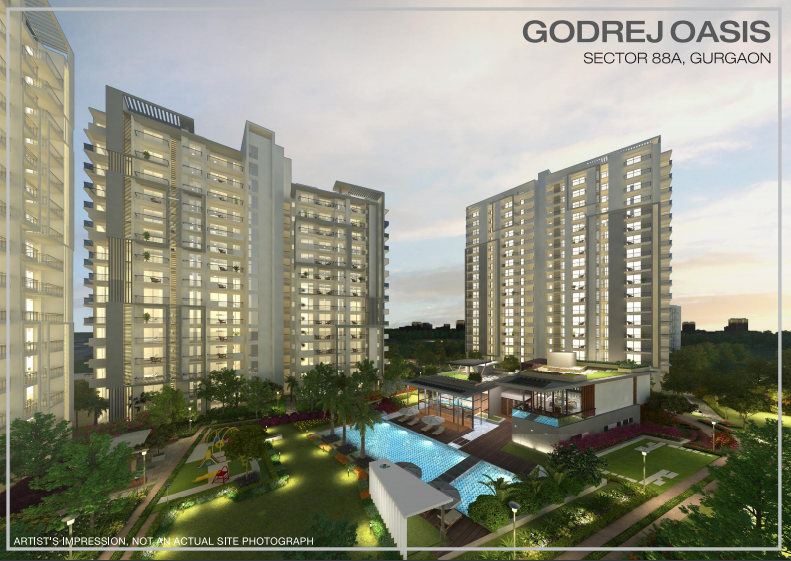 Godrej Gurgaon meets the expectations and needs of the homeowners in every possible way.